The most fun thing you can do in your home is to replace the wax ring on a toilet. (sarcasm anybody?) There are a number of reasons you may need to do this joyous task. You may want to paint or wallpaper behind the toilet, and need to remove it to access the wall behind. 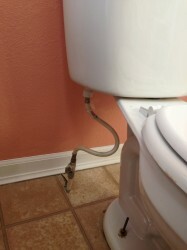 The toilet could break for whatever reason, and replacing the toilet means replacing the wax ring. Another reason to replace the wax ring on a toilet, the reason I’ve changed mine, is because we moved into this house, and every time we flush, a little bit of nasty liquid seeps out where the seal should be. Firstly, turn off the supply to the toilet itself. Then flush the toilet to get as much water out of it as possible. After the toilet is flushed, unhook the water supply line from the tank. Next, loose the nuts holding your toilet to the floor and remove the washers. This will free the toilet from the floor and the plumbing below. Remove the toilet, keeping it as level as possible. The toilet bowl probably still has water in it. I placed my toilet into the full sized tub. Now that the old wax ring is visible, look into the sewage line and be sure that none of the wax has broken off into the line. If it is clear, I recommend putting a rag into the hole to keep sewer gases from coming out while cleaning the old wax ring off. Use a putty knife to clear away the old wax ring, and dispose of it in the garbage. Now clear, replace the wax ring on the toilet. The flange on the bottom of the toilet should be cleared of wax, and dry. 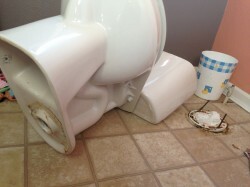 Then push the new wax toilet ring onto the bottom of the commode. Be sure that if you have a flanged ring, that you put the flange out, so it protrudes into the sewer line when you place the toilet over the sewer line. 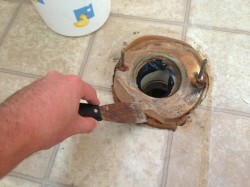 Be sure that before you place the toilet over the sewer, you remove the rag from the sewer line. 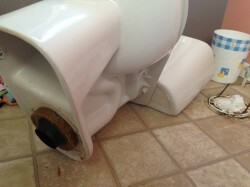 Once you’ve placed the toilet over the sewer line, use your body weight to push the toilet to the floor, rotating it slightly from side to side to be sure the wax seal is completely sealed. Replace the washers, and tighten the nuts, but not too tight as the porcelain is easily cracked. Reattach the water supply line. Now turn the supply back on and test the toilet. I’ve seen plumbers then silicone around the bottom edge of the toilet at this point. I assume this is to prevent water from getting under the toilet in case of an overflow or just a wet floor. The only tools you’ll need to complete “How to replace the wax ring on a toilet” are a simple Adjustable Wrench , Putty Knife , rag, and replacement Wax Toilet Ring .